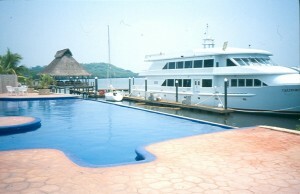 The Marina Puesta Del Sol is located in the Pacific coastal community of Aserradores in the Cosigüina Peninsula of Nicaragua. The Cosigüina Peninsula is an agricultural area characterised by extreme rural poverty surrounded by coastal communities such as Aserradores in which most families have traditionally made their living by artisanal fishing and small-scale shrimp farming. Few of the 143 communities in the area have electricity and outside the main town of El Viejo the water supply is from wells or rivers and the most common sanitation system is a sump latrine. The village of Aserradores has a population of approximately 500. The Marina Puesta Del Sol is the project of Roberto Membreño, a millionaire US businessman who was born in Nicaragua. Begun in the year 2001, the marina and hotel complex has around 120 berths and a hotel offering 33 luxury suites, a driving range, swimming pools, tennis courts, air strip, helipad, restaurants, shops and many other smaller facilities for guests. Membreño recognises that few of the locals will be able to provide the services he requires for his guests in Marina Puesta Del Sol without training. He argues forcefully, however, that the benefits of his seafaring tourism development trickle down to the locals through the construction phase of the project in which some of them were hired as labourers and trainees for positions such as service providers and attendants. He also believes that the development could give rise to a range of other related businesses in the vicinity. The potential for trickle-down benefit in the community exists, and it is hard to find anyone in Aserradores who does not acknowledge that some local people have benefited through employment in the development. It is not difficult, however, to find local opposition to the marina – the story of Marina Puesta Del Sol2005 mpds piscina y yate is not as clear-cut and as widely beneficial as the developer’s publicity claims. The development has necessitated the purchase of a considerable amount of land in Aserradores, most of which is now policed by private guards and protected by barbed wire and ‘Private Property’ notices. The fishermen of the community have been left with only one narrow access point to the estuary, now crowded with boats; access to the estuary and the sea is prohibited in all but a few points which are not owned by Sr. Membreño; most of the land previously owned by the Mario Carrio Chevez fishing cooperative in agreement with the municipality was sold off, in dubious circumstances, to Sr. Membreño; two short stretches of estuarine mangrove vegetation have been destroyed and replaced by white sand brought from the Pacific Ocean coast of the area; and heavy pressure has been exerted on one particular family to quit their land which now forms something of an island surrounded by the marina. On the destruction of mangroves either side of the major quay to make way for white sand brought in from the nearby Pacific coast, in my discussions with him in 2003 Sr. Membreño was fulsome in his praise of the geologist who had assured him that the respective ecosystems would not be adversely affected. It has to be remarked, however, that it would be difficult to find any environmentalist or a geologist not in Membreño’s pay who would agree that such actions would have no effect. The [fishing] cooperative gave up its rights to the Marina Puesta Del Sol and the marina began to develop a hostile attitude towards various residents, including my family. … [Membreño] has managed, through buying influence, to turn the illegal into the legal. … Bit by bit he has closed down our spaces along the estuary and at his whim they have closed our access to the sea for subsistence. … The judicial system in Nicaragua is very easy to corrupt. Everybody, including the Garay family, welcomed the new tourism project enthusiastically because it meant work and increasing affluence for all. But it seems that this investor has his own vision of how he wants the countryside to appear and what type of people he wants to see there, so he has closed the public right of way to the shore (which is unconstitutional, but which the authorities have allowed), he has prohibited his employees from making purchases in Garay’s mini-store, he has tried to throw them off the Island of Aserradores (despite their land titles), and he has been supported in this ugly game by all the powers of the state. Some benefits have trickled down to a few members of the community of Aserradores, but these appear to have been more than offset by the trickle-down of a number of disbenefits to various residents, although it is an impossible task to quantify the net effect of these different impacts. But putting aside all the eulogistic publicity material in favour of the development, all the local criticisms against it and all doubts about the very notion of the trickle-down effect, probably the most telling comparison to make is the fact that the amount of money invested in the Marina Puesta Del Sol could have provided a safe potable water supply for every person in the whole of the Cosigüina Peninsula. Such an investment would have spread the health and security benefits of this amount of money to a huge number of people instead of leisure and luxury benefits to a tiny number of people whose wealth is already great enough to ensure their basic human needs and rights. Roberto Membreño (April 2003) In discussion with Martin Mowforth and others, Aserradores, Nicaragua. SELVA (2003) ‘Información Linea Base para el Diseño de Proyectos de Desarrollo de la Comunidad de Aserradores’, El Viejo, Nicaragua. Francisco José Maliaño Molina (September 2004) In interview, Aserradores, Nicaragua. Juan Alberto Chieres Casco (September 2004) In interview, Aserradores, Nicaragua. Max and Tadea Garay (September 2004) In interview, Aserradores, Nicaragua. Allan Bolt (19 December 2002) ‘Turismo, soberanía y desarrollo’, El Nuevo Diario, Managua.